The morning after BlogHer and WoolfCamp, I spent some time in bed with Moomin reading to me from a comic-book edition of Tarzan illustrated by Burne Hogarth. I love to hear his dramatic readings of purple prose; he sounds like an old-time radio announcer or a voiceover on a 70s superhero cartoon. This is probablly not an accident since I do play old radio Lone Ranger episodes (downloaded) and Rook watches a ton of cartoons off Netflix with him. As he drew the taut bowstring, the great cat sprang. The silvered missile leaped to meet her in mid-air. As quickly as Sabor hit the ground, Tarzan whirled and sank another shaft, and a third… lightninglike, struck her in the eye. In a screaming rage the onrushing body bore him down; but even as he fell, his powerful knife struck again and again before he realized his mighty adversary was dead. A wave of exultation swept over Tarzan of the Apes. I like to think that he is getting excellent lessons in prose style from this. Am I wrong? And will he like the Odyssey? I think so! It’s not far off! Later I was trying to give him a pin from BlogHer, a little button with the dinosaur from Lulu.com. An extended conversation on “cool” followed. If this makes us seem too fight-and-might obsessed… He is also strangely concerned with how he’s going to grow up and save manatees from motorboats. I’m not sure why manatees rather than something smaller and cuter – maybe because they’re huge and yet helpless, and they eat cabbages. Good lord. 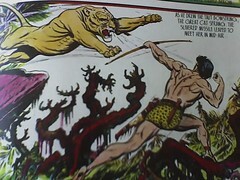 I read that Burne Hogarth adaptation of Tarzan at least twenty times at a formative age; just seeing that art is enough to give me severe flashbacks to elementary school. If it includes a history of Hogarth's art and the strip, I have the same edition.I found mine in my grandparents' house in the Netherlands, of all places; where did yours come from? The education level of a person is his identity in the society and in the world. A person is known by the type of education he has in the professional world. No one knows a person by his name but his skills and education level.